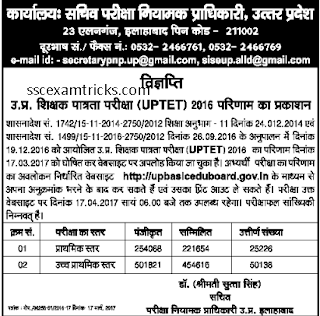 UPTET Result 2017 – UPTET 2017 Scorecard Merit List - www.upbasiceduboard.gov.in. The good news is that UPTET has uploaded the result/ scorecard on 30th November 2017 on official website www.upbasiceduboard.gov.in. Earlier UPTET had conducted written test on 15th October 2017. The candidates are waiting for their result. The result is likely to be declared on 30.11.2017. The result of UPTET exam 2017 was planned to be announced on 28th February at the official website www.upbasiceduboard.gov.in, but unfortunately, it did not get announced on this date. The latest news is that UPTET 2016-17 result has been declared on 17th March 2017 and will be available up to 17th April 2017 on the official website. UP Basic Education Board had invited online applications for eligibility test from 05th October to 28th October 2016 on the official website. Huge numbers of candidates had applied for this test. The UPTET 2017 was successfully conducted on 19th December 2016 at various centers across UP state. · Candidates go to the website of UPTET at @upbasiceduboard.gov.in. · Read all the details in the application form. · Click on the online application form. · Fill the application form with correct details. · After fill, all the form click on submit button and your form will be submitted. 1. Click on the link provided at the bottom. 2. Enter your roll number of 10 digits and enter image code provided on the page. 3. Finally, press ‘Proceed’ button.